Comfort, stability and beauty; the Louis Philippe Euro Bed comes standard with slat ends that are secured to solid hardwood side rails to ensure stability, and a center leg for maximum mattress support on king and queen size beds. Sleek and stately, the Louis Philippe Euro Sleigh Bed is guaranteed to bring sophistication and class into your bedroom. 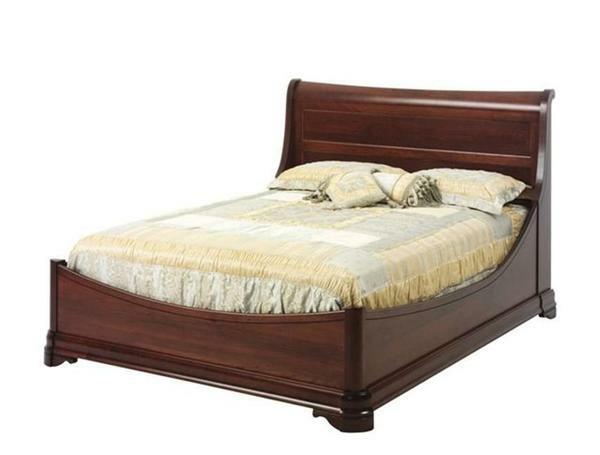 The Louis Philippe Euro bed is offered with stain, glaze, paint or distressed finish. You can also customize your wood selection between seven stunning solid hardwood species! Please call us today with any questions you may have on this stunning Amish Louis Philippe Euro Sleigh Bed - Toll Free at 1-(866)-272-6773. *Please note that this will lower the mattress position relative to the head and footboard as shown in the photo.